Delays to the Hong Kong-Zhuhai-Macau Bridge, scheduled to open last October, now look like postponing the operation to as late as 2021. By then, it is anticipated that both the Shenzhen-Zhongshan Bridge and Humen No.2 Bridge will be up and running as well as the opening of the new International Air Cargo Hub at Maoming in western Guangdong. The manufacturing and logistics landscape of PRD will be radically different from that anticipated in 2007 when the project was given the go ahead. 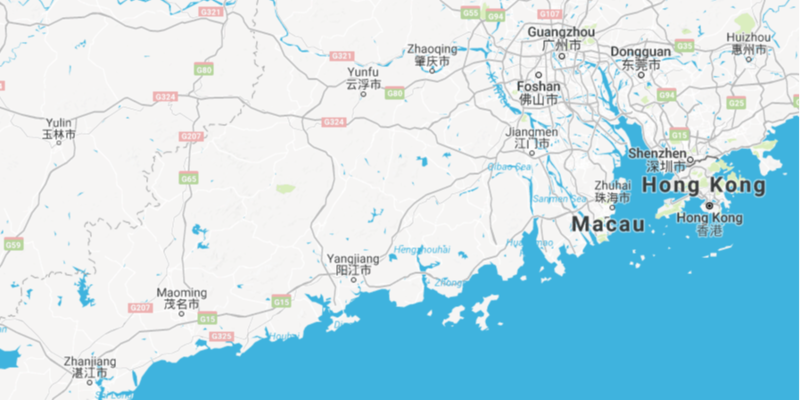 ​When Shenzhen was denied a connection with the proposed Hong Kong-Macau-Zhuhai Bridge (HMZB) back in 2004 it then started planning for its own dedicated 43 km connection across the Pearl River Estuary, and finally got the go ahead in 2011. ​The Shenzhen-Zhongshan (Shenzhong) Bridge, under construction and due to open in 2021, links directly from the Shenzhen International Airport into the heartland of the western Pearl River Delta Area, centred on Zhongshan, Jiangmen and the Kaiping-Zhongshan expressway. It will greatly alleviate traffic congestion crossing the existing Humen Bridge but more importantly offers the potential to directly transfer goods and passengers through Shenzhen Airport instead of Guangzhou, raising the stakes further in the David and Goliath battle for pre-eminence between the two airports, as Shenzhen continues to take a bigger and bigger slice of the PRD pie. ​​​​With Guangzhou at the apex of the Pearl River, it is already perfectly situated to service the vast area of under developed Western Guangdong. Justification for the HZMB came from being able to bring the area within a reachable three-hour commuting radius of Hong Kong. This was seen as being able to enhance the attractiveness of the area to external investment and conducive to the upgrading of its industrial structure. Hong Kong appeared all set to benefit from this new economic hinterland, with its vast human and land resources, by providing opportunities for Hong Kong business to expand operation in the Mainland, particularly in the sectors of tourism, finance and commerce. The Hong Kong Government in particular stressed its ability to enhance Hong Kong’s position as a trade and logistics hub as goods from the Western PRD and Western Guangdong, Guangxi, etc., can better make use of the airport and container ports in Hong Kong. ​​However, caught out in the middle, Shenzhen struck back. As well as adding the Shenzhong Bridge, attention turned to the great bottleneck that is the existing Humen Pearl River Bridge crossing, completed in 1997 and currently the only crossing over the southern mouth of the river. 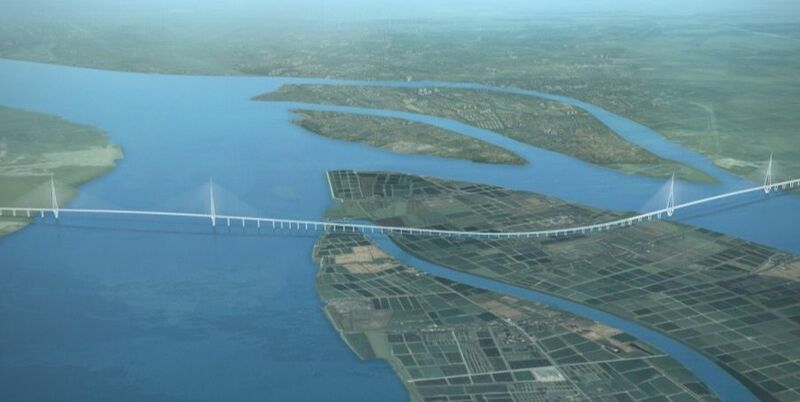 Located at the historic point of the battles of the opium wars, where the Pearl River mouth narrows significantly, a second bridge crossing will be added with the construction of Humen No. 2 Bridge about 10 km to the north. It is scheduled to open in 2019. ​​​​The great hinterland of the western PRD, the area that Hong Kong visionary of Hopewell Holdings Gordon Wu first identified back in 1998 as being the future of the city by bridging Hong Kong with the bonanza of resources lying in wait on the far side of the Pearl River, is about to be spoilt for connection choices to both sea and air ports for its people and products. 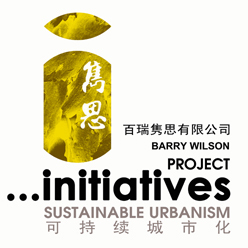 Despite the HZMB being able to dramatically reduce the time it takes to travel between the Hong Kong and this hinterland it may already be too late in arriving. Surrounding infrastructure has moved on apace, perhaps negating the benefits, whilst it can be anticipated that the costs of transporting via the new Chinese bridges will be cheaper than via HZMB in both fees and fuel. The terms of the loan financing arrangements mean that the toll levels for HZMB may well be set at around ¥100 for private cars and ¥200 for trucks,  twice the anticipated cost of the Shenzhong Bridge. 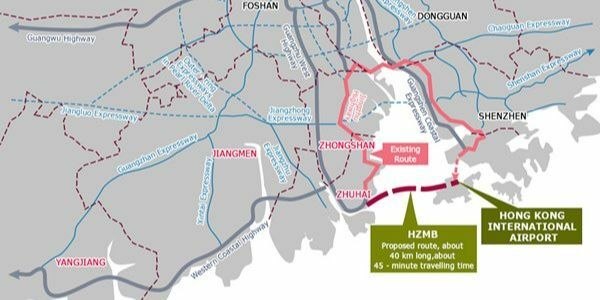 ​Attempting to keep up with the regional changes, Hong Kong Airport, currently the world’s largest air cargo hub, is struggling to add a 3rd runway and continues to await the supposed bounty of its new connection to Western Guangdong through the HZMB link. Whilst the new Maoming airport forecasts to take just 600,000 tonnes  of cargo by 2020, a small amount perhaps at about 10% of the projected throughput of Hong Kong at that period, it is however generated in the very area, Western Guangdong, that Hong Kong airport targets for growth based on the connection of the HZMB link. 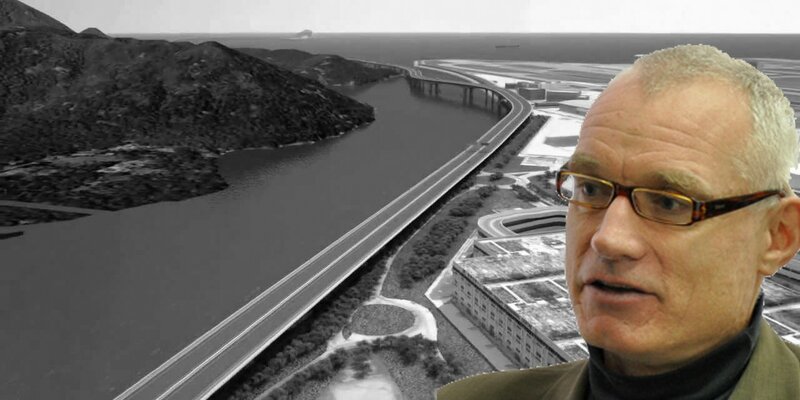 It raises the very possibility that the projected new business that justifies the 3rd runway and HZMB will be seriously shackled, especially as the Maoming hub will no doubt attempt to expand rapidly to divert Guangdong goods westerly rather than travelling east more expensively through Guangzhou, Shenzhen and Hong Kong. It’s becoming an increasingly cluttered and competitive logistics environment. Selected private vehicle users with dual licence plates for China or Macau. Can we really trust these figures? The 13,200 trips expected at HZMB make up just over 9% of the total vehicle crossings anticipated for 2020. Back in 2007, Planning Department anticipated a whopping 142,800 average daily crossings however. 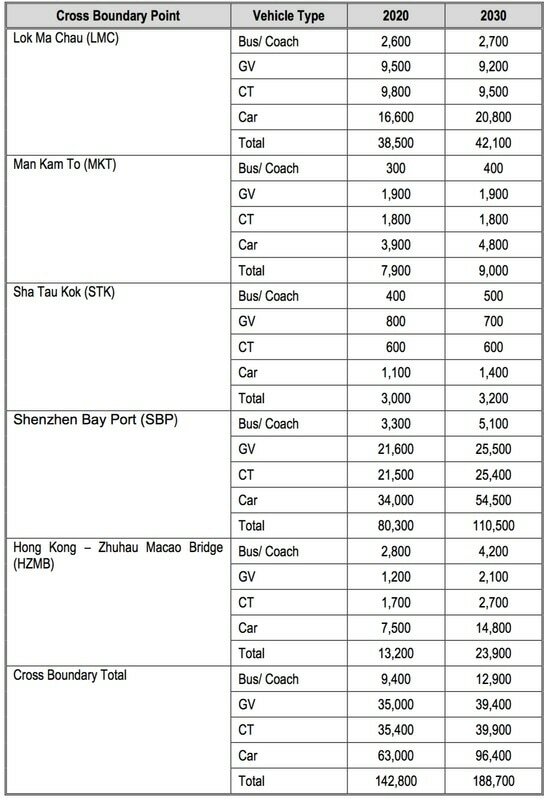 The average daily cross boundary vehicle trips between Hong Kong and the Mainland, at all four combined crossing points, rose from 35,800 in 2003 to 43,000 in 2010. However, since 2010, the number of vehicle trips has remained relatively stable. 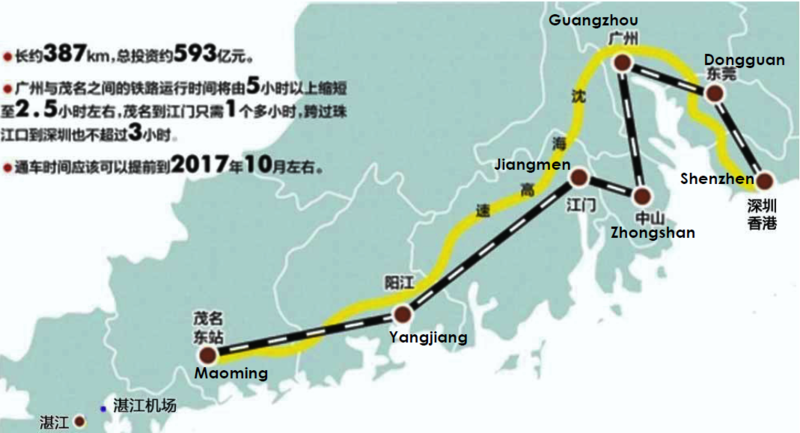 The present cross-boundary traffic between Hong Kong and Guangdong, has a daily average of just 41,600,  way below the massive volumes projected 10 years ago. ​Clearly the planning forecasts are frighteningly way out, by more than 3-fold. The last bridge connection built to China was the Shenzhen Bay Bridge Link, a shorter, more direct link to the metropolis of Shenzhen. It makes an interesting case study. Back in 2007, just after opening, traffic volumes were predicted at 80,000 vehicles / day by 2016. 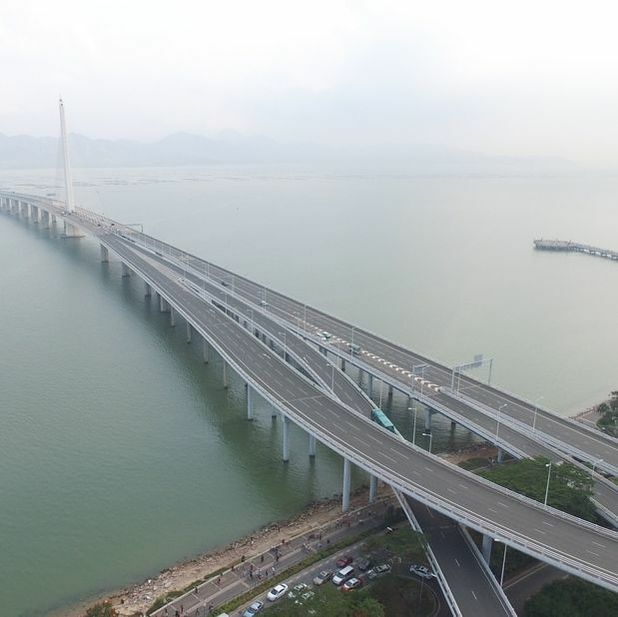 "We expect Shenzhen Bay Bridge's two-way daily traffic will be 29,800 vehicles during its initial period of opening, and will rise to 60,300 vehicles a day in 2016," Highways Department Chief Engineer Ma Ming-yiu confidently stated. 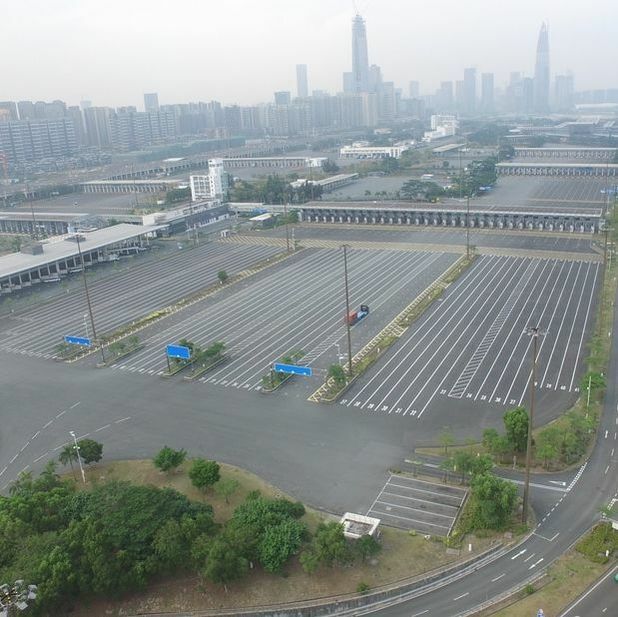 Currently, the average daily number of vehicle trips recorded at Shenzhen Bay crossing is 10,400 or about 25% of the total volume for all crossings. ​The Hong Kong population is both aging and only marginally growing. The city is at capacity in terms of housing and highways. Chinese citizens can visit California or Thailand for tourism rather than Hong Kong. What will generate a further 3-fold increase in cross boundary activity in the next 20 years to justify the projections after little has changed over the last decade? ​Once finally open, the Hong Kong-Zhuhai-Macau Bridge is set to be the jewel in the crown of recent underutilised Hong Kong infrastructure. The cost has been exorbitant and the PRD is a very different development region from that envisaged 10 years ago. Built without the option to add a railway it will undoubtedly prove to be the whitest of white elephants. Change Is Coming...... Too Fast Or Not Fast Enough?